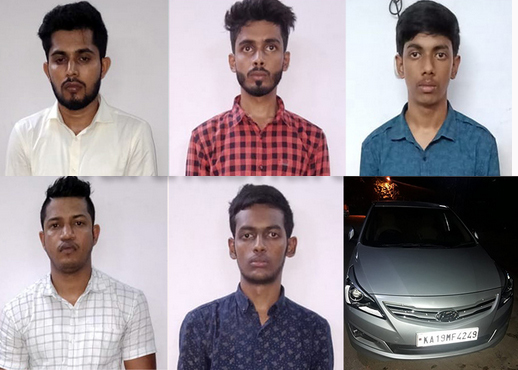 Bantwal, Oct 22, 2018: Bantwal Police have arrested five youngsters on the charges of obstructing the police from performing their duties and abusing the latter at BC Road Narayana Guru Circle on October 21, Sunday. Those arrested are Jithesh (31), Vikesh (27), Austin (23), Arvin (21) ad Aldrin (18). The car in which the five were travelling has been seized. Traffic SI Manjula KM and other staff were inspecting vehicles at Narayana Guru Circle as usual on Sunday evening when the car with tinted glass was stopped on finding that the driver was also not wearing seat belt. But the accused began to abuse the lady cop in most foul language following which SI Manjula lodged a complaint. Subsequently the five were arrested.